Dark streaks known as recurring slope lineae (RSL) on the walls of Mars’ Palikir Crater, as seen by NASA’s Mars Reconnaissance Orbiter. RSL streaks may be evidence of liquid water. The water thought to be responsible for Mars' intriguing seasonal dark streaks may be coming from very deep underground, a new study suggests. These streaks, known as recurring slope lineae (RSL), appear on some Martian slopes during warm parts of the year. Scientists have posited that RSL are caused by transient flows of briny water at, or just beneath, the Red Planet's surface. "We suggest that this may not be true," study co-author Essam Heggy, a research scientist at the University of Southern California (USC) and NASA's Jet Propulsion Laboratory in Pasadena, said in a statement. "We propose an alternative hypothesis that they originate from a deep pressurized groundwater source, which comes to the surface moving upward along ground cracks." And Heggy does mean deep: The aquifers feeding the RSL likely lie about 2,460 feet (750 meters) underground, according to the new study. Heggy and lead author Abotalib Z. Abotalib, a postdoctoral research associate at USC, studied imagery captured by NASA's Mars Reconnaissance Orbiter (MRO), which discovered RSL back in 2011. 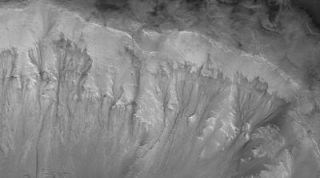 They looked specifically at three RSL-bearing craters, as well as streaks in the huge canyon complex Valles Marineris. Abotalib and Heggy found a spatial correlation between RSL and tectonic and impact-related faults — features that could facilitate the movement of water from deep underground to the surface. The duo also modeled heat flow in the Martian subsurface and studied underground water movement in desert regions here on Earth. These various lines of research indicate that RSL water is probably coming from deeply buried briny aquifers, the researchers said. "The experience we gained from our research in desert hydrology was the cornerstone in reaching this conclusion," Abotalib said in the same statement. "We have seen the same mechanisms in the North African Sahara and in the Arabian Peninsula, and it helped us explore the same mechanism on Mars." Their proposed explanation also explains the seasonality of RSL. "The system shuts down during winter seasons, when the ascending near-surface water freezes within fault pathways, and resumes during summer seasons when brine temperatures rise above the freezing point," the researchers wrote in the new study, which was published last week in the journal Nature Geoscience. If Abotalib and Heggy are right, Mars' deep groundwater system is more extensive than previously thought. Last year, Europe's Mars Express orbiter found evidence for a big subsurface lake near the planet's south pole, but signs of aquifers at lower latitudes have been lacking to date. The new study is far from the last word on RSL, however. For example, not everyone thinks the streaks are indeed evidence of liquid water; some scientists regard dry landslides as a more likely explanation. And there could be more than one RSL-formation mechanism operating on Mars, Abotalib and Heggy noted.